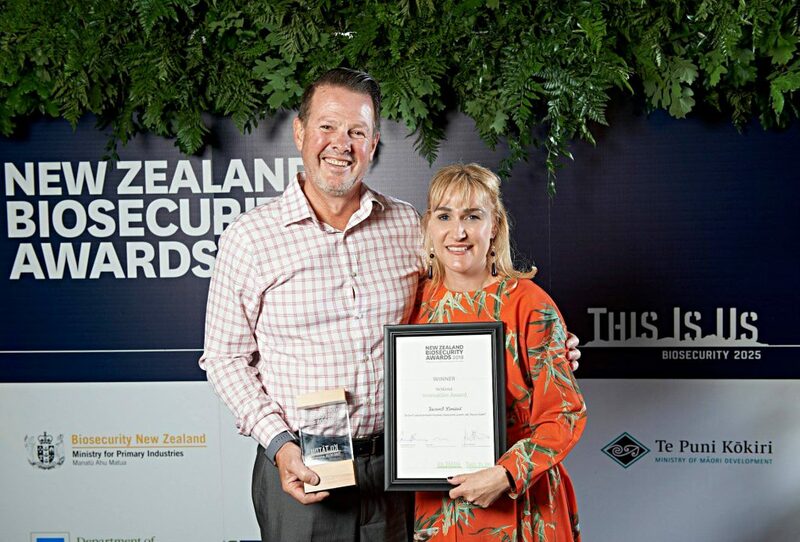 It was an honour to be named winner of the innovation category at this year’s Biosecurity Awards which were held in Auckland this week. Biosecurity underpins the New Zealand environment, lifestyle, economy and identity, and it was amazing to be sitting among people from around Aotearoa who are working so hard to protect what’s precious. To be honest, this accolade took us completely by surprise – we were up against some fantastic projects. For us, this award provides encouragement and a vote of confidence in our work and the Jacson Cube®. It also helps us spread the word to rural professionals, farmers and growers that professional, purpose-built tools make practicing good biosecurity faster, more effective, and more sustainable over the longer term. This is important, because, in the words of the Minister – our system is under pressure and we all need to respond. The theme of this year’s awards and biosecurity forum was “Partnering to protect”, and there are many people who have partnered with us to bring the Jacson Cube® to market, whether through professional services, feedback, advice or connections. You are too many to name and we thank you all. Most importantly we thank the businesses and organisations who have seen the potential of the Jacson Cube® and are using it in their daily work to help prevent the spread of diseases, seeds and weeds. We know that footwear biosecurity is only one part of a biosecurity plan – but it is an important and highly visible one, that sets the tone for biosecurity at the farm, orchard or nursery gate. It takes all of us to protect what we’ve got, and the Government is calling for all New Zealanders to support the implementation of the Biosecurity 2025 implementation plan. You can download the plan from the Ko Tātou, This is us website.